The TNTgis family of professional software products from MicroImages provides advanced GIS, image processing, and geospatial analysis at an affordable price. Used in over 120 countries around the world and translated into 24 languages. MicroImages stands behind TNTgis software with responsive free software support. Complete professional package integrating GIS, image processing, terrain analysis and surface modeling, LIDAR visualization/processing, geodatabase management, desktop cartography, and web map publishing. Includes all the capabilities of TNTedit and TNTview. Professional interactive tools to view, create, georeference, edit, and import/export geospatial data (image, vector, CAD, shape, LIDAR, TIN) with associated relational databases. View and interpret any type of geospatial data (image, vector, CAD, shape, LIDAR, TIN). View data in 2D, stereo, and 3D perspective, and view/edit associated relational databases. Automate geospatial processing and geoprovisioning using local, network and cloud computing resources. All TNTgis software runs on both Windows and Mac OS X.
TNTmips is an advanced Geographic Information System that integrates display and processing of map data, imagery, and terrain data along with the creation and management of associated relational databases. 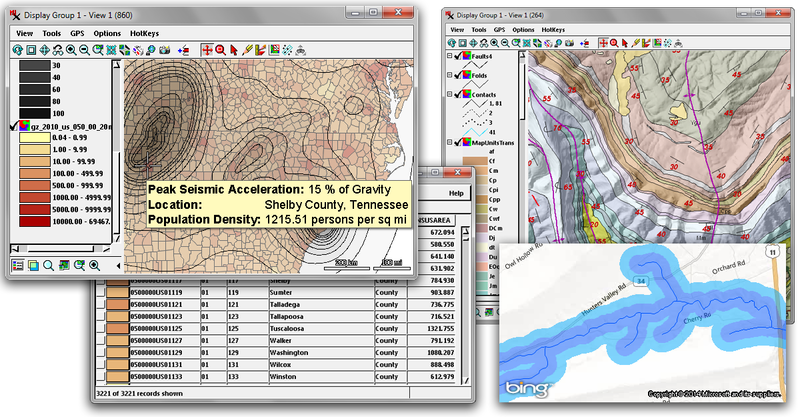 TNTmips provides all the tools needed to create, edit, georeference, interpret, and publish any type of geospatial data. Geospatial analysis processes are provided for geometric (vector, CAD, shape) map data as well as for imagery and terrain data so that you can easily turn your geospatial data into geospatial information. The results of your project analysis can be styled and annotated for printing, turned into an electronic atlas, or converted to web tilesets and assembled in geomashups for viewing on the Internet in a web browser. Using TNTmips you can take on projects in agricultural management, environmental monitoring, mineral exploration, wildlife management, disaster relief, land stewardship, archaeology, site planning, and many other application areas. 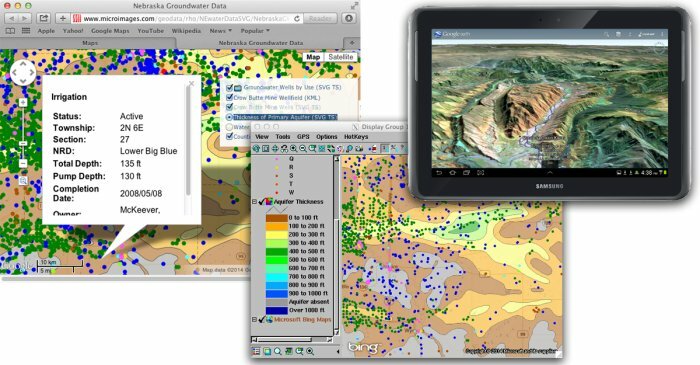 TNTmips combines full GIS capability with a powerful suite of image processing and analysis tools. You can enhance, combine, rectify, mosaic, and classify aerial or satellite images up to terabytes in size to optimize information extraction and data presentation. Fast, efficient processing is provided by the unique TNTgis image processing pipeline architecture and the TNTgis Job Processing system, which allows simultaneous execution of multiple jobs to maximize use of your multi-core computer. Extensive classification tools for multispectral images include automated unsupervised and supervised classification with post-classification analysis and error checking as well as the unique, interactive Feature Mapping process that lets you use your visual interpretive skills to guide an incremental computer classification of an image. Each of the TNTgis software products provide the tools you need to view your geospatial layers in their true three-dimensional terrain context. View your map, image, and terrain data in 2D, in oblique perspective views, or in stereoscopic 3D using inexpensive anaglyph glasses or your 3D monitor or TV. To create stereoscopic views you can use your own terrain data or the on-line web terrain tilesets hosted at microimages.com. Visualize LIDAR point clouds as dynamic surface renderings and generate profiles through the point cloud along any line you choose. 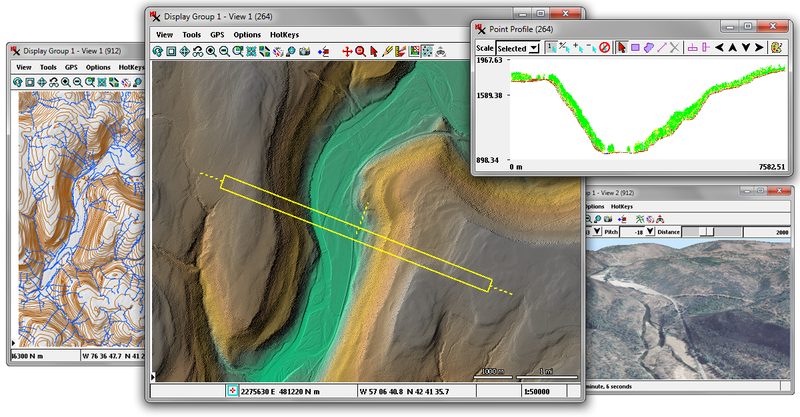 TNTmips also includes powerful terrain analysis and modeling tools. Extract hydrologic catchments and drainage patterns in the Watershed process, model terrain visibility in the Viewshed process, or compute terrain slope and curvature in the Topographic Properties process. Work with terrain data as raster DEMs, terrain tilesets, contours, TINs, or point clouds and convert between them in the Surface Modeling process. Each of the professional TNTgis software products let you view your geospatial data in combination with public web data. Global basemaps and imagery from Bing Maps and MapQuest can be added to views of your data with just a few mouse clicks. You can also view global and U.S. state imagery tilesets hosted at microimages.com or any geodata layer available from public Web Map Service sites. Using TNTmips you can also prepare and publish your own data for viewing on the Internet, a private network, or in 3D in Google Earth on your desktop, tablet, or phone. You can convert your imagery or vector maps of any size, scale, and detail to web tilesets that can be used efficiently on the web. You can then use the Assemble Geomashup process to combine these tilesets with the global basemaps and imagery available in popular web mapping platforms (Google Maps, Bing Maps, Open Layers, and Google Earth) to produce web pages that present your data to your entire organization or to the world on any desktop computer, tablet, or phone.